Professional sport has changed considerably over the years. Much of it is down to technology: tennis rackets are no longer wooden, footballs don't have pig bladders inside them any more and pigeons – now made of clay – don't have to fear for their lives at shooting events. One sport that has been totally transformed by technology is Formula 1. There was a time, believe it or not, when it was more about the drivers than the cars themselves. During the seventies there were some real characters behind the wheel, none more so than Britain's James Hunt. 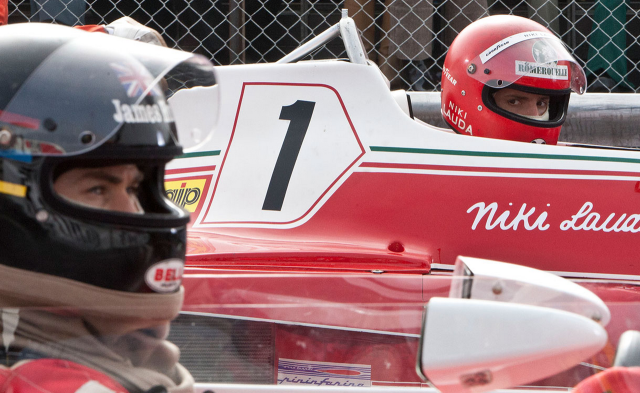 This film charts the relationship Hunt had with fellow driver Niki Lauda and their most competitive Formula 1 season together. In the early seventies, a driver by the name of James Hunt (Chris Hemsworth) was tipped as being one to watch in the world of motor racing. At the same time, Austrian Niki Lauda (Daniel Brühl) was showing true grit and determination to make a real name for himself in the sport too. Their approaches to life and the sport were very different: Hunt was passionate about driving, but had many other passions too, including women and drink; Lauda however, was all about the driving. Where Hunt was naturally gifted, Lauda was more technically so. Both showed more than enough talent to get them promoted from the world of Formula 3 to the far more glamorous world of Formula 1. It was there, in 1976, that the pair's fierce rivalry exploded onto the world stage in what was to become one of the most memorable and eventful seasons in the sport's history. I'm just hoping I can get past these lights before that guy with the rag and bucket tries and clean my windscreen. Although Hunt wasn't necessarily a successful driver in terms of actual Grand Prix events won, his story – particularly his personal battle with Lauda – makes for fascinating viewing. What makes director Ron Howard's take on it all the more watchable are the two central performances by Hemsworth and Brühl; the pair of them manage to make two larger than life characters just that. Hemsworth, an Aussie (who, it should also be said, spent four years on the soap Home & Away), oozes the charm and flamboyant nature of Brit Hunt, whilst Brühl, a Spaniard, taps in beautifully to the matter-of-factness of Austrian Lauda. Surprisingly, the only real let down are the driving sequences. Considering the blistering speeds the cars race at and the exhilaration that the sport is known for, many of the race scenes feel flat in comparison. Thankfully though, they don't let the film down overall as the drivers are the real stars here, not the races. The film also cements Howard's position as one of the most diverse directors on the film circuit today, who has a great eye for bringing quirky projects to the mainstream. Rush is a fond reminder of how exciting Formula 1 used to be, being full of characters as it was and far less clinical. Even if fast cars leave you cold, this story of Hunt and Lauda won't fail to win you over.